The defense is likely to appeal the verdict and raise legal questions about how the trial was conducted. We’ll chronicle fallout from the case and what happens next here. 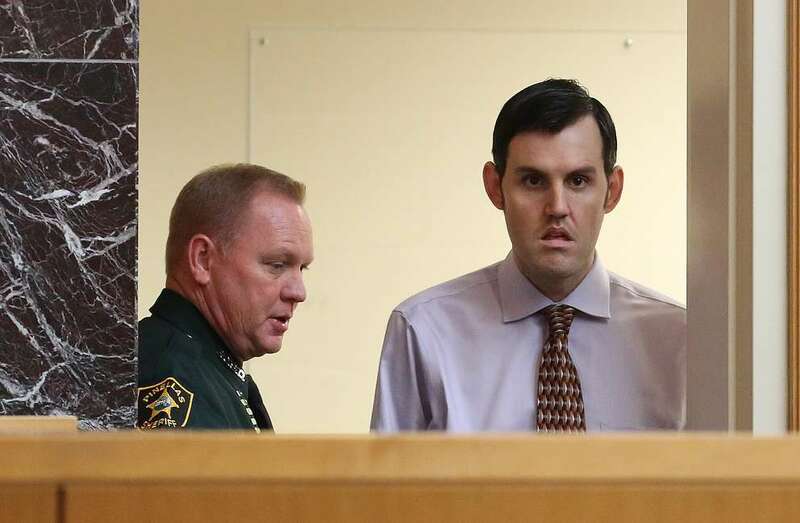 After four years, John Jonchuck is finally set to stand trial on a charge that he murdered his 5-year-old daughter, Phoebe, by dropping her from a bridge into the cold water of Tampa Bay. Soon after his arrest in the early hours of Jan. 8, 2015, Jonchuck was deemed mentally incompetent to stand trial. He has received medication ever since in the North Florida Evaluation and Treatment Center outside Gainesville. Doctors say he is now ready for court. There is no doubt he did it. A police officer, just off a late shift, saw the then 25-year-old father drop his little girl over the edge. Jonchuck in court records admitted he did it and has described voices that urged him to kill her. The trial will instead hinge on a basic question: Was he evil or insane? Phoebe fell 62 feet, a few horrifying seconds before she hit the water. But the story begins much earlier, sweeping across generations of domestic strife, drugs, religious fixation and violence. It all led to one moment, on top of the bridge, and the still unanswered question of whether John Jonchuck knew what he was doing was wrong. If you find that (defendant) committed the crime but you find by clear and convincing evidence that the defendant was insane, then you should find [him] [her] not guilty by reason of insanity. John Nicholas Jonchuck Jr. was born in Tampa in 1989 and had a tumultuous childhood. His mother left him around the time he was 5 in the care of an uncle before his father came back to raise him. At 12, he attacked his father, though he said it was in self defense. As a young adult, Jonchuck was arrested multiple times and charged with domestic violence against his mom and Phoebe’s mom . He also has a documented history of drug and alcohol abuse. He has been involuntarily committed 27 times under the Baker Act, which is used when you are deemed a danger to yourself or others. The Long Fall of Phoebe Jonchuck: Read Lane DeGregory’s three-part series on John’s life and Phoebe’s death. John Jonchuck Jr.'s mug shots. Row one: May 2008, May 2010, February 2012 and January 2013. Row two: May 2013, June 2013, November 2013 and January 2015. During the first week of January, John texts six people asking them to forgive him. No one responds. He also becomes obsessed with his stepmom’s Swedish Bible and spreads salt around the doorways to keep out evil spirits. He tells his stepmom Phoebe is a demon. John’s lawyer, Genevieve Torres, calls DCF, saying that he is delusional and has a child with him. 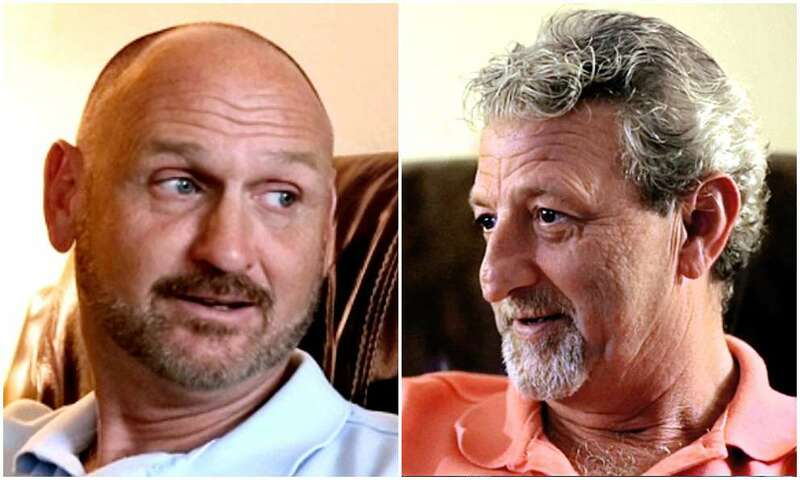 Since John is at his stepmom’s house, and his stepmom also is there with Phoebe, DCF decides not to investigate. Later, John takes Phoebe to three churches, begging priests for an exorcism. When he comes out of one priest’s office, Hillsborough County sheriff’s deputies are waiting. But the priest says John isn’t a danger to himself or anyone else. So they let him go. That night, he and Phoebe eat dinner with his parents and his mom, and fall asleep on the couch. About 10 p.m., his dad and stepmom hear the front door open. 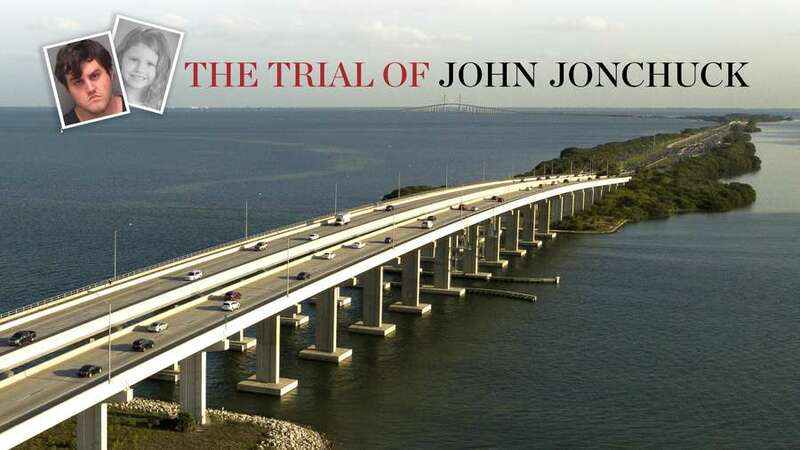 Around midnight, a policeman sees John speeding toward the Sunshine Skyway Bridge and pulls behind him, lights flashing. 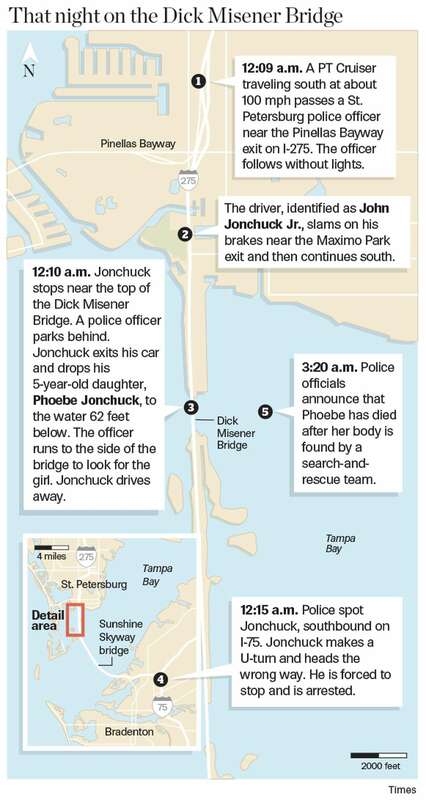 When John stops, the officer watches as he carries Phoebe to the bridge railing — and drops her into Tampa Bay. A rescue crew later finds her body floating. John leads police on a high-speed chase across the bridge and is eventually arrested and charged with murder, assault, fleeing and eluding police. 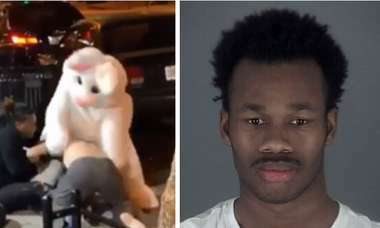 Officers hold him for a mental evaluation. That night, the DCF secretary calls for an investigation into how Phoebe’s previous cases were handled. The officer who watched John drop Phoebe, then tried to find her, is rewarded for his rescue efforts. Doctors say John is still incompetent to stand trial. Jonchuck deemed competent to stand trial. The Jonchuck trial is delayed just a week before it’s supposed to begin. At last pre-trial hearing, defense loses two motions. Debate centers on whether experts can describe Jonchuck as a psychopath. Killed Jan., 8, 2015, at age 5. She was in kindergarten at Cleveland Elementary. Phoebe’s father. 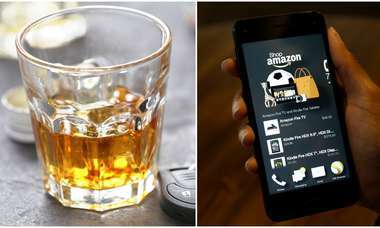 An unemployed telemarketer with a history of arrests for DUI, battery and domestic violence. He was Baker Acted 27 times. Phoebe’s mother. Diagnosed with multiple sclerosis right after Phoebe was born. Accused over the years of child neglect, forgery and shoplifting. Phoebe’s paternal grandmother. She abandoned her son when he was 5 and has her own history of arrests and drug abuse. Maw Maw’s brother, John’s uncle. Owns a commercial roofing company. Helped raise John and wanted to adopt Phoebe. Bryan’s partner for 29 years. Bryan Morris, at left, and Tim Maynard. John’s father. A construction worker with a history of arrests, including domestic violence against John’s mother and John. John’s stepmother and Phoebe’s step-grandmother. 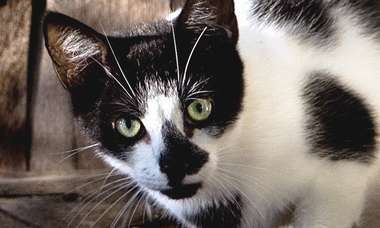 Retired from the Air Force, she helped raise John and sometimes took in Phoebe. St. Petersburg Police officer who pulled John over on the approach to the Sunshine Skyway Bridge and watched him drop Phoebe over the side. Tampa attorney. John took Phoebe to visit her the day before Phoebe died. He insisted the lawyer could read a Swedish Bible to him. After he left, she called police. Jonchuck’s lead counsel. She has been a public defender for nearly 12 years. She has been an assistant public defender for more than 15 years, 14 in the Pinellas-Pasco office. He has been an assistant public defender for more than 30 years and has been trying murder cases for 25. A division chief in the state attorney’s office. He joined the staff there in 1985. A trial attorney for the prosecution. He’s been on staff since 2007. Pinellas-Pasco circuit judge. Has been on the bench for more than a decade; was an assistant public defender for more than 25 years. She has presided in about two dozen murder trials.